I am taking the leap into a few high chroma pigments in oil. It's not that I need an intensely high chroma color but that I want a higher chroma's ability to mix into an extended range of colors. To that end I first tubed up Viridian, a lovely blue-leaning transparent green. 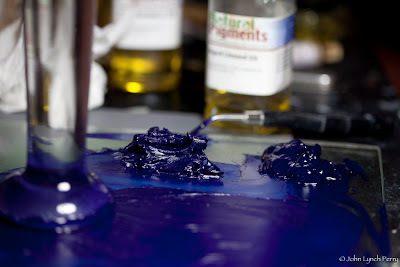 Next I mulled Ultramarine Blue. My usual procedure is to first mix oil and pigment on a glass grinding plate with a palette knife. Once the materials combine I turn to the muller. 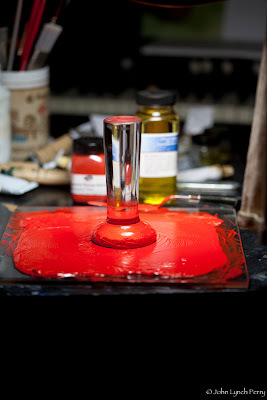 With this pigment, mulling caused the paint to become runny. You can see that effect here--the pile on the left is palette knife mixed whereas the pile on the right has been subsequently mulled. I then went back and added dry pigment to firm up the mix. According to what I've read, Ultramarine Blue is often allowed to "sweat", that is to let rest for a week or two as it again softens up. More pigment is added and remulled. This process may continue for more than one round to fully develop this paint. I have my mix in a cat food can sealed with plastic wrap, which I'll check back on in a few days. 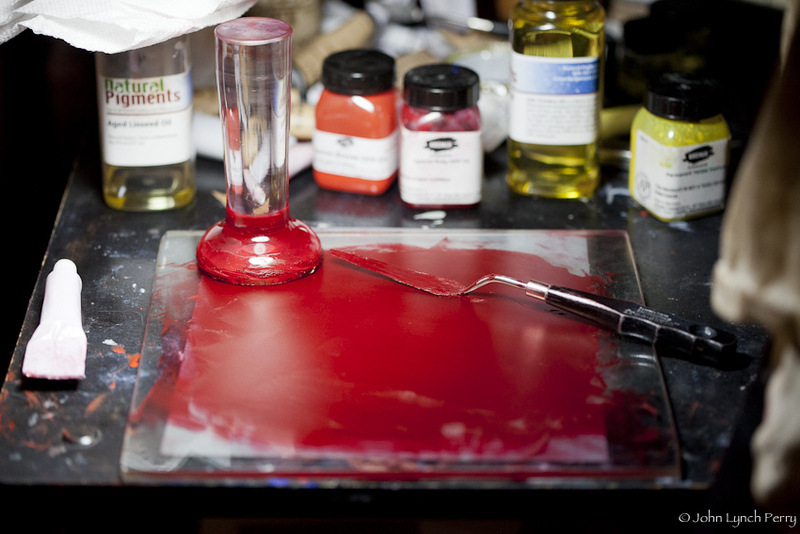 Here's a batch Irgazine Scarlet PR255 underway. This pigment is documented as having a granular nature that requires extra breaking down with the muller and that was experienced here. I had to apply extra pressure on the muller to quicken the breakup of obvious clumps. I forgot to grab a picture before tubing but the scraped palette still shows the intense cool red of this Irgazine Ruby PR264. Makes me think I have the beginnings of a split primary palette.